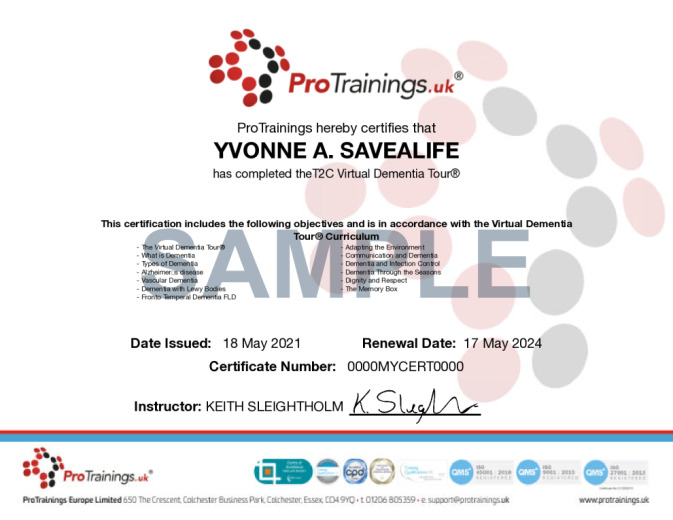 ProTrainings partnering with Training2Care under licence with Second Wind Dreams to offer the Virtual Dementia Tour®. Caring for another human being requires a special kind of person - someone who is empathetic, patient and kind. But how can a person who cares for the elderly be empathetic when they have never experienced old age in its fragile state? We make decisions for and about our elders as though we know what they are coping with. Lessening the chasm between us and our elderly gives us a greater chance of meeting their needs. Learning to create a positive environment for those with Dementia can only come from attempting to walk in their shoes. The Virtual Dementia Tour® experience is a unique, interactive training experience that is proven to improve communication and care. Created by P.K. Beville, a specialist in Geriatrics, this valuable Dementia awareness training experience is designed to give individuals and organisations the ability to help identify with and understand people with Dementia's behaviours and needs. This amazing training is ideal for anyone who comes into direct or indirect contact with this condition and include new employees, hospitals, Nursing homes, residential Homes, universities, law enforcement, churches, doctors, individuals working in the public sector, department of transportation, and anyone caring for a loved one in their home. After experiencing the Virtual Dementia Tour® training, caregivers will be able to identify with and better understand the behaviours and needs of those in their care. T2C working in Partnership with Second Wind Dreams® are proud to bring this amazing training that has been experienced by nearly 1,000,000 people worldwide, now the UK. 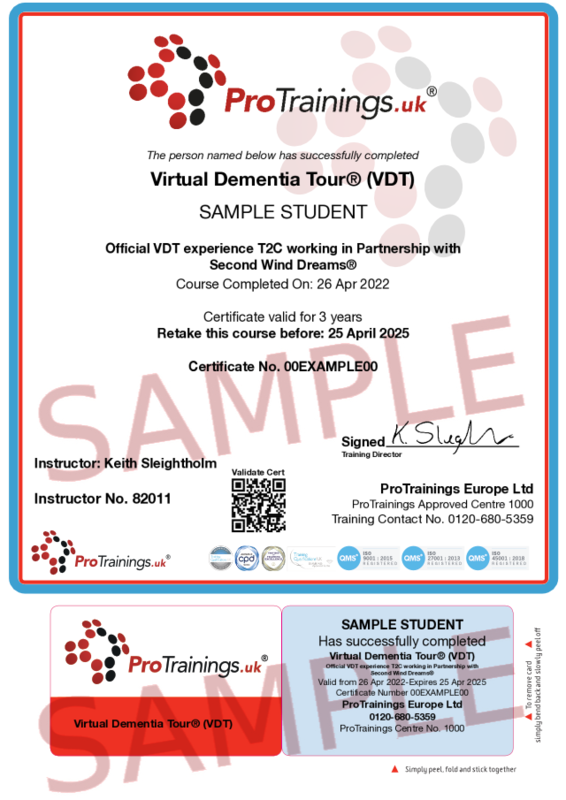 Free when you take the Virtual Dementia Tour® is access to downloads, Dementia manual, 50 Plus First Aid student manual, discounts off our video online training including Dementia Awareness and the VDT video library. Before you buy the online part, contact us to book the practical part locally or to discuss how we can arrange a demonstration to your care home or organisation. Has been experienced by close to 1,000,000 people and is in 17 countries. Has been demonstrated to many of the nation’s top business and policy leaders including representatives of Facebook, Google, the U.S. Dept. of Health & Human Services, members of Parliament and attendees of The Innovation Summit at Harvard. Meets and exceeds guidelines set by the latest White House Conference on Aging to increase dementia training in the general public. Meets and exceeds the federal mandate requiring every healthcare entity providing care to those with memory impairments such as dementia to have additional, ongoing training in dementia care. Is endorsed by the Alzheimer’s Foundation of America. a. Provide participants with an experiential simulation to help understand what dementia may be like. b. Caregivers will develop a greater understanding of the challenges faced daily by dementia patients resulting in better care. c. Participants will learn how behaviour problems in Dementia can be viewed as coping strategies thereby changing how we work with them. This course comes with 3.0 hours of CPD, although the time to complete the course online may be less than this. Total course time includes 2 hours and 34 minutes of video training as well as knowledge reviews, final test, remedial help and reviewing downloaded material.